What&apos;s the Deal with Airplane Breakfast? It begins in the disorienting moment that airplane cabin lights blaze on, shortly before the descent of a long-haul red-eye flight. You’re either startled awake or else reminded that you never got comfortable enough to sleep. Suddenly the cabin fills with the aroma of airline coffee. Soon follows the telltale rattle of a breakfast cart inching its way down the aisle. As if by Pavlovian response, you lower your seatback tray, and your stomach growls just loudly enough to cause the passenger beside you to shift away slightly. It doesn’t matter that your general opinion of airline food is less than favorable; you are prepared to partake of the sacrament of the airplane breakfast. The strategy is to lean into the mediocrity of the meal—to embrace the compartmentalized continental offering of a shrinkwrapped mini-pastry, sweetened yogurt, and nearly colorless fruit. Breakfast menus vary in quality across the commercial airlines and routes, and especially among the separate cabin classes of each carrier, but the conventional wisdom is that, compared with the other dining experiences that consumers are prepared to pay for out in the world, the food served on flights leaves much to be desired. It wasn’t always this way. Inflight cuisine was once a major selling point used by airlines to entice the burgeoning tourist class off of trains and steamships and into the sky. 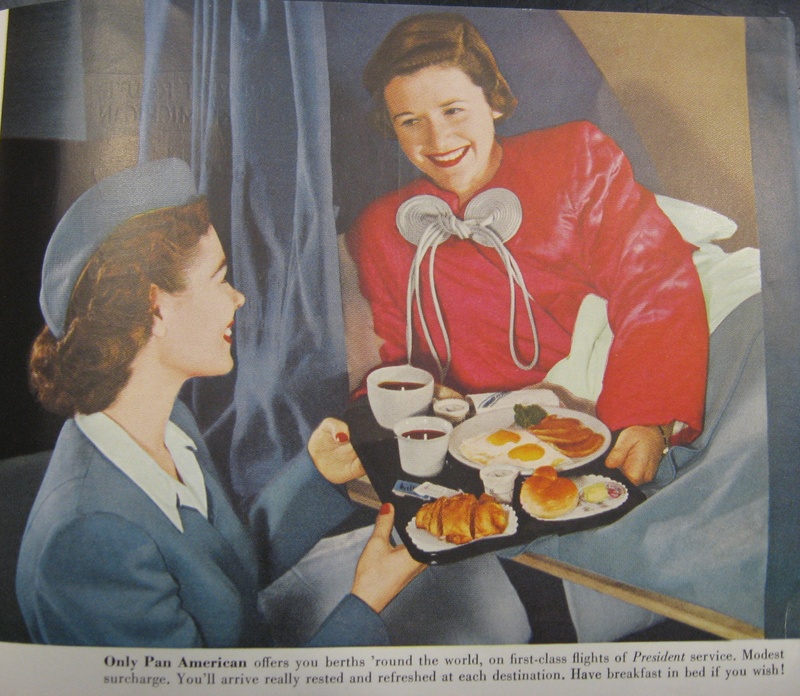 During the early postwar years, first-class passengers flying long-distance on Pan American World Airways were offered fully reclined private sleeping berths; they then woke up to hot, tray-service breakfasts in bed of coffee, eggs, pancakes, and full-size pastries with real butter. During the golden age of commercial air travel, from the 1950s until the deregulation of federally controlled ticket prices and routes, the only way for the few carriers to compete for passengers was by turning a transatlantic flight into a mile-high lesson in luxury. This included fine dining. In a 1958 Pan Am promotional film introducing the first American commercial jet service from New York to London, we see well-dressed members of the newly inaugurated jet set reclining their seats for easy slumber. Their coffee is poured from silver carafes; their hot breakfast is served on china dishes, set atop white tablecloth-draped tray tables with surface areas four times what they are now. “Delicious food adds to the enjoyment,” the narrator says of the atmosphere onboard the brand new Boeing 707. The menu at the time featured food catered by Maxim’s of Paris. Taking a closer look at the glamorous advertisements of the golden age of air travel, one does wonder whether some of this contemporary perception might simply be a result of the vanished sense of magic associated with flying. At the start of the jet age, innovation and novelty had as much to do with the allure of inflight dining as did the food itself. The narrator of the 1958 Pan Am Jet Clipper commercial boasts that inflight food is “prepared in four simultaneously operated galleys, where dishes can be cooked in five-minute ovens.” In 1945, Pan Am worked with American inventor Clarence Birdseye and the Maxson Company to develop the convection oven, and a year later the microwave oven was born. A lingering postwar aptitude for efficiency colored such services impressive instead of impersonal—the way they’re seen during today’s farm-to-table renaissance. Part of the effect of air travel’s novelty having worn off is that we also forget the necessary special preparation methods and logistics involved in serving food to hundreds of passengers at a point several hours into a flight. Though efficient and safe, this technology would hardly be used as a selling point today. What was once a praiseworthy food prep innovation is today the same tool used by detractors to point to the uninspired state of airplane food. The decline in the novelty of airplane travel—and perhaps the beginning of the airplane breakfast’s downward slope—began when flights became more accessible to the masses, and thus more subject to the demands of a mass audience. Despite the company’s international reputation for luxury, Pan Am founder Juan Trippe’s ultimate vision was for an “everyman airplane.” This led to the commission, and then the 1970 debut, of the Boeing 747 jumbo jet—and with it the advent of the tourist fare. Maybe the subtle success of an inflight breakfast, then, exists simply because it is one of the few moments in air travel where the golden age novelty of flying carries over. Federal airline-industry deregulation in 1978 prompted fierce fare wars among the legacy carriers. Soon the luxury inflight cuisine and amenities that had once been used as selling points were abandoned in favor of attracting passengers through price alone. Cabin service across U.S. carriers saw the most drastic cuts. While inflight meals were once expected with the price of a ticket, this complimentary meal service was one of the first amenities to go from transcontinental routes. In October 2010, Continental Airlines (which completed a merger with United that same year) was the last domestic carrier to jettison free meals on flights under six hours in length. Today, passengers flying with domestic carriers must resort to buy-onboard breakfasts if they want to eat before getting settled in at their destinations. And these purchased meals carry considerably less of the aforementioned ritual charm that accompanies a breakfast that simply appears on your tray. Four decades later, despite the fact that competition between airlines has been reduced again, inflight cuisine, onboard space, and other diminished amenities still reflect the drastic, even desperate, conditions of extreme post-deregulation competition. Passengers are as likely today as they were ten years ago to encounter the dispirited continental breakfast staple of semi-opaque honeydew slivers that suggest they would be best viewed under black light. A certain level of fine dining does still exist on long-haul flights, but it is most likely to be offered by foreign airlines. Epicurious calls Turkish Airlines “a food lover’s fantasy,” and compares the menus on Singapore Airlines to those of Michelin-starred restaurants. “Comparing breakfast on U.S.-based airlines with a number of international carriers isn't a matter of apples and oranges; it's more like apples and rotten apples,” says travel and food writer Elyse Pasquale, who has flown over 100,000 miles a year almost every year since 2010. The more impressive breakfasts for passengers on domestic airlines are almost always experienced by those seated in premium cabins. Airlines like United and Delta tout celebrity chef-designed menus for meals served in their first and business classes. Delta is also attempting to tap into the contemporary food space’s hyper interest in local and sustainable ingredients. A new partnership between Delta, Danny Meyer’s Union Square Cafe, and urban rooftop farm Gotham Greens conceivably allows for produce to be harvested in Brooklyn one morning and then served hours later onboard a transatlantic flight from JFK as ingredients in a breakfast menu item like Chef Carmen Quagliata’s potato and parmesan frittata with tomato Hollandaise and asparagus. Served, that is, to passengers in the Delta One cabin. Main cabin passengers will have to wait until they’re back on solid ground to indulge in their own localvore tendencies. In 2015 Delta began serving Starbucks coffee on all its flights, and United now serves complimentary Italian Illy brand coffee to all passengers. But despite these renewed efforts to make inflight meals attractive, general public perception of airline cuisine remains less than enthusiastic. Maybe the subtle success of an inflight breakfast, then, exists simply because it is one of the few moments in air travel where the golden age novelty of flying carries over. In the same way that the roadtrip trifecta of charred black coffee, greasy eggs, and a desert sunrise will satisfy a specific kind of hunger during a weary traveler’s diner pit-stop, an airplane breakfast provides fulfillment only in effect with its environment, within the passenger’s momentary context. Even the most jaded traveler is capable of being faintly, fleetingly impressed by waking up at 40,000 feet to a full meal, and looking out the window to observe the patchwork of land and miniature urban systems that make up a country so very far from home.